If you think you have no room for a chess set, think again! These innovative sets utilize vertical space to provide a full-sized chess experience with a miniscule footprint. Vertical chess boards are the ultimate in space saving chess sets. When you don’t have a lot of space to work with, and you would rather not compromise by getting a teeny tiny set, a vertical chess board can offer the perfect solution. These boards are mounted on the wall, so they take up next to no room. You don’t need to make space for a table and chairs to accommodate this type of chess board – all you need to do is set aside a little wall space. You can’t beat the minimal footprint of a wall mounted chess board. Everyone has a little bit of empty wall space, so you should have no trouble finding the perfect spot for your vertical chess set. Players may stand to make their moves and, if they need a break, sit on any of the other furniture nearby. If you have room for it, you may even set up a pair of chairs or bar stools at which players can sit during their games. 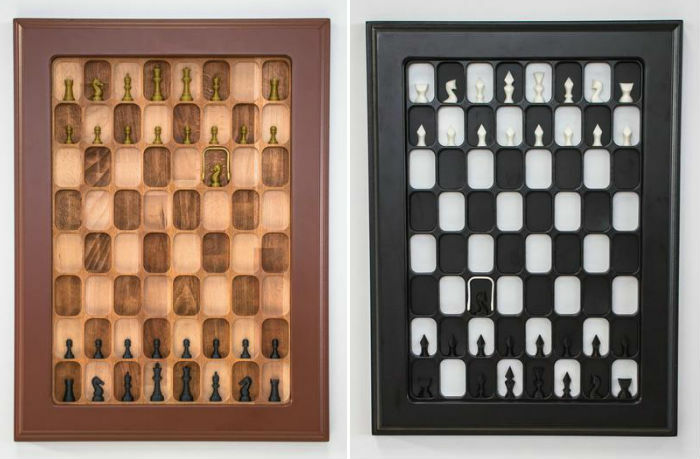 Another great thing about this type of chess board is that they are not only extremely convenient for tight spaces, but they’re also quite beautiful and can serve as a lovely wall decoration and a functional object all in one. 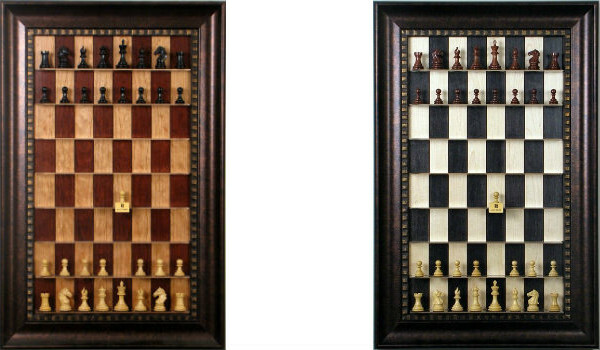 When not in use, these wall mounted chess boards do a great impression of a piece of framed artwork. Visitors may even be surprised to learn that it’s a functional chess set! The Straight Up Chess Board is a groundbreaking product from The House of Staunton. 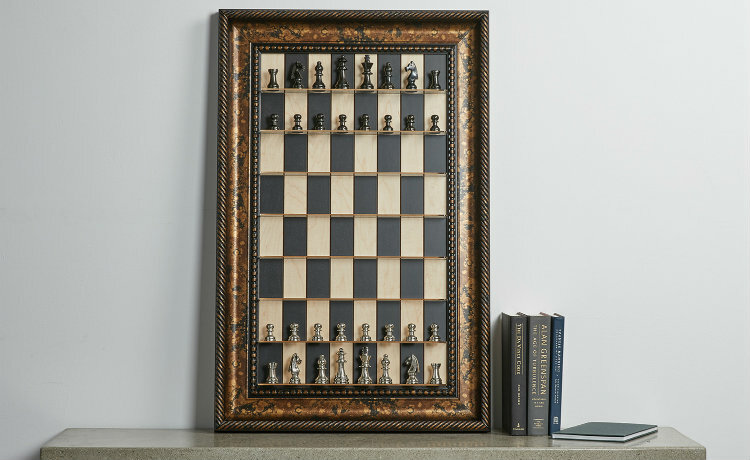 They’ve really perfected the art of the vertical chess board and have made this product available in a multitude of different colors, wood types, and frame designs. There are a total of 68 Different Straight Up Chess Boards listed on their website! With that kind of variety, you’re bound to find something that matches any decor. 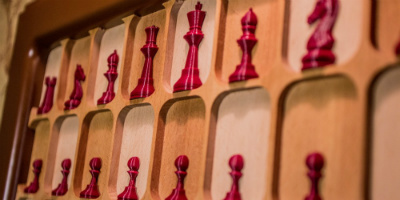 We recommend taking some time to scroll through the listings if you’re interested in this vertical chess board so that you can find the one that best fits your taste. 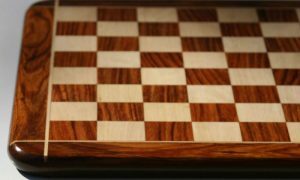 No matter which style you choose, rest assured that all of the products in the Straight Up Chess line, and indeed all of the products made by The House of Staunton, are made from the highest quality materials available. The great thing about the design of this vertical chess board, other than its elegant looks of course, is that it will work with almost any set of chessmen you prefer. The chess pieces are held up on clear platforms that will accommodate your favorite set. 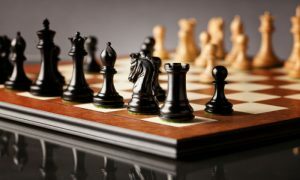 You can buy the vertical chess board with square sizes ranging from 3 inches to 4.5 inches for an additional cost, so be sure to choose one with a square size that matches or exceeds the height of the tallest piece in the set of chessmen you’d like to use. 68 Different Types to Choose! This vertical chess set features a more modern design than the traditional Straight Up Chess Board. 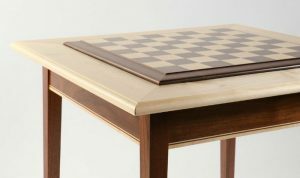 It comes in one, low-contrast colorway, and the pieces are included with this Wall Mounted Chess Board, making it a great value for the money. Everything about this vertical chess set is modern, from its aesthetics all the way down to the way in which it was manufactured. 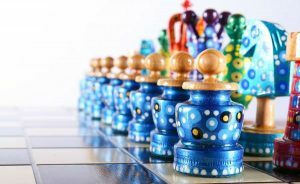 Each one of these wall mounted chess boards is made from CNC machined Beechwood lacquered to a glossy finish for beauty and longevity. The pieces are 3D printed from PLA, which is a specific type of biodegradable thermoplastic derived from sustainable sources. This wall chess board set also includes a small printed insert that can be placed on the board to indicate the last move that was made, which is perfect for playing a messenger style game of chess. With this feature and the board’s unique vertical design, you and your opponent can take your turns whenever you pass by the board, and you won’t have to worry about playing out of turn or having the pieces knocked out of place by a curious cat! Vertical chess boards are the perfect solution for those with little space to spare, or anyone with a pet or small child who may be a little too curious about the strange little figurines up on the table. A vertical chess board keeps everything up and out of the way, as well as out of reach of little hands or paws. The only question now is which one works better for your space, and since they’re at such similar price points, that’s a question that largely comes down to style. Those who prefer a more traditional looking chess boards will almost certainly opt for The Straight Up Chess Board. 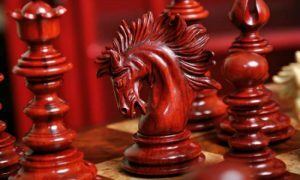 Its strong contrasting woods and ornate frame make it an innovative take on chess that maintains the traditional aesthetic. 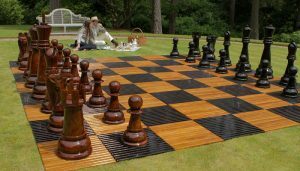 The Straight Up Chess Board also comes in a wide variety of colors – more than any other chess board we’ve seen, so you should have no problem finding one that fits any room of the house. 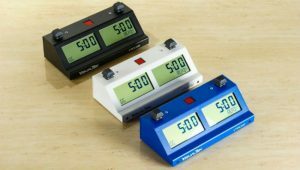 It can also accommodate almost any set of chess pieces, so that allows you more control over the final look of the wall mounted board. The chess pieces you use can totally transform the vertical board and draw the eye. 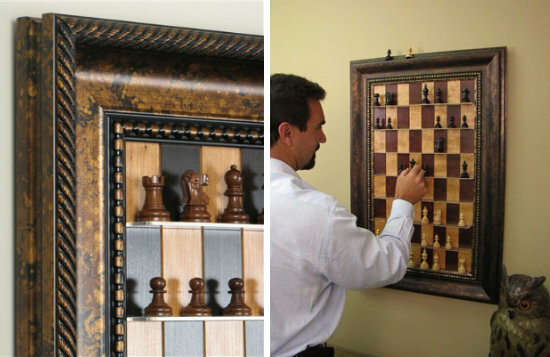 The Wall Mounted Chess Board certainly features a more modern design, but it only comes in one colorway. If that clashes with the color scheme of the room you’d like to put it in, you may find yourself buying the Straight Up Chess Board instead, just for the sake of matching. It depends which is more important to you – modern design with sleek lines, or a harmonious color palette.